Newgates knocker (as in the phrase "as black as Newgate's knocker") refers to the knocker on the large black gates of the old Newgate Prison. 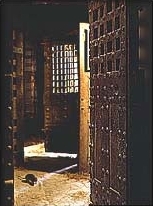 There is no longer a prison on the site, but you can see a reconstruction of part of it with the original iron doors in the Macabre London gallery at the Museum of London, which is only just off Newgate Street. The original Prison was built in 1188 and named Newgate as it was built several hundred years after the original four gates of the City of London. 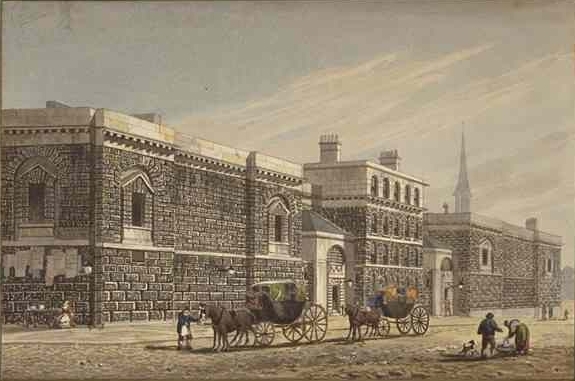 It was rebuilt in 1770, but just ten years later the prison was badly damaged in the Gordon riots of 1780 and so a new prison was designed and built, completed in 1782. In 1783, the gallows were moved to Newgate and it became London's chief prison with many executions. The site of Newgate Prison is now the location of The Old Bailey, Central Criminal Court.